With keyless entry and smartphone-controlled locking, a smart lock turns your humble front door into a hi-tech access point to your home. 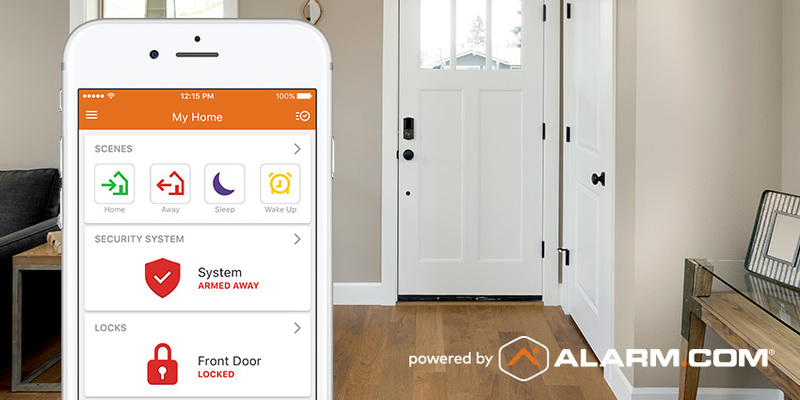 If you want a really smart front door, however, you need a smart lock powered by Alarm.com. 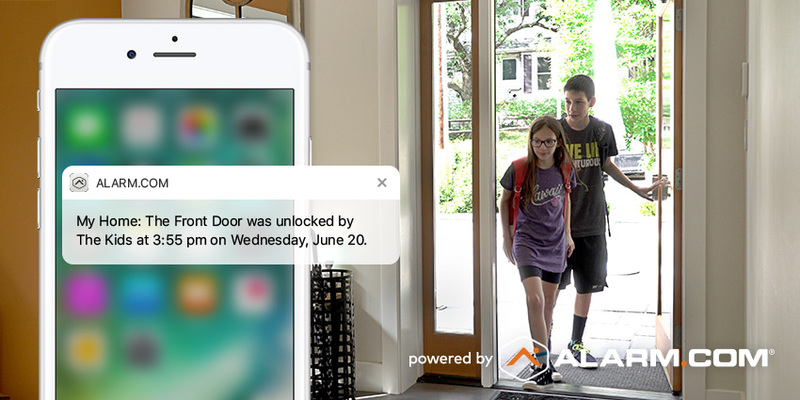 The August Smart Lock Pro is the latest lock to join Alarm.com’s smart home security ecosystem, where keyless convenience meets enhanced security, better awareness and an array of proactive safeguards for your home and family. 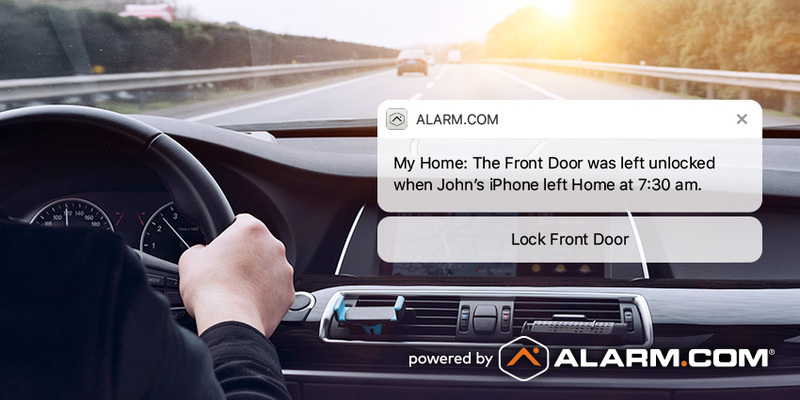 Linked to the other smart devices in your home, automated and controlled through our smart security platform, and able to trigger alerts and actions on your behalf, Alarm.com-powered smart locks give you more versatility and value every day. Here are four (smarter) ways to use them. All smart locks let you unlock your door remotely. With Alarm.com, you can also unlock securely, using your Alarm.com doorbell camera to see exactly who you’re letting in. This, in turn, makes things very convenient. Say you’re expecting a valuable delivery but can’t stay home from work. No problem. When the delivery driver rings your doorbell, you’ll get an Alarm.com alert that turns into a video feed. You can verify and talk to the driver, then unlock your door—all from the same screen—and have them leave your delivery safely inside. Alarm.com Scenes are useful commands, with names like Home, Away, and Sleep, that activate several different devices at once. With smart locks powered by Alarm.com, Scenes can include access control. Tapping your Home button as you arrive home will unlock your door and disarm your security system. Tapping the Sleep button last thing at night will lock your doors and arm the system, as well as turning the thermostat down. And if you’re looking for an extra level of convenience, our Scenes can now be voice-activated through your Amazon Echo, with PIN-protected commands for unlocking your doors. Did you know that one in three burglaries involve no forcible entry? In the USA, 500,000 burglaries a year are made easier by homeowners who neglect or forget to lock their doors and windows. As part of an Alarm.com-powered home, your smart lock becomes a proactive defense against unlawful entry, triggering a smartphone reminder if you (or your family) leave home without locking up, or haven’t locked up by a certain time of day. These reminders come with a ‘lock’ command included, so you don’t even need to open your app—much less turn around and come home. If your Alarm.com-powered smart lock has a numerical keypad, your family and trusted visitors can open it with an Alarm.com user code. User codes make access easy—eliminating both the problem of spare keys and the need for you to remotely unlock your door. You can customize them so they only work at certain times of day (good for a dog-walker) or expire on a given date. As well as making things convenient, user codes help you stay aware of who’s coming and going, with custom alert options that can tell you exactly who just unlocked your door. Want to upgrade your door with an Alarm.com-powered smart lock? If you already have an Alarm.com-powered smart home security system, your service provider can quickly upgrade your doors with smart locks and other smart devices, including indoor, outdoor and doorbell security cameras, and even a smart thermostat.